After being woken at 6:15 by the morning call to prayer we waited for the Javanese style breakfast we’d been promised the day before. At 7am the tap on the door came and Paul went out to fetch a tray with 2 plain omelettes and a pile of toast with cheese and chocolate on it! The egg was quite nice but the toast was so stale/ toasted that it was now a closer relation to a Farley’s Rusk and cheese with chocolate sauce does not go. The coffee wasn’t much better and we quickly grabbed our things and left before they could poison us further. We knew we had to get a bus from Wonosobo to Semarang but that was as far as we’d got with our plans, so next stop was the bus terminal. Upon arriving we wandered around looking lost until directed to a small booth. Here they asked where we were going, clarified that it would be a mini van that left at 9, and relieved us of 140k rph, then at 8:50 a guy rushes over to us and gestures that we needed to get in a big 6 seater car with 2 other Indonesian ladies as this would be our transport to the city. The bus should take about 3hrs but this guy managed to get us there in about 1.5 because his foot was either on the gas or the brake – there was no in-between and I was very glad to get out in one piece at the end although I felt as sick as a pig. Our accommodation for the next 2 nights was a Quest hotel near Chinatown, same chain as the Favehotel in Jakarta and Neo hotel in Yogyakarta. It was a slightly tired looking business hotel but it was cheap and included a buffet breakfast. The most pressing need was for us to get some laundry done, so a quick freshen up and we went out to explore with our 5kg of washing! The first place was shut for a week due to staff holidays, the second and third places were closed because it was Sunday but hidden away on a back street was Sweety Laundry and here amongst the rats and litter we left our clothes and agreed to collect them the following evening. Gasping for a drink we stopped at the first little resto we saw and gazed at the non English menu wondering what we should try. Help arrived with a young waitress that was eager to practise the English she was learning at uni, so after talking about weather, London, high heeled shoes and sneakers she helped translate the menu for us. 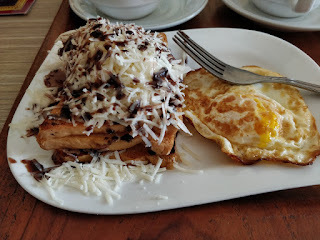 I’d already sussed that a local speciality was Lumpia – a kind of spring roll, so we had a couple of them and something the waitress recommended called Es Campur. 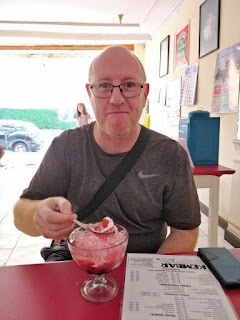 Es Campur was basically a bowl of shaved / crushed ice, some weird cubes of fruit jelly, coconut shavings and a sickly sweet syrup. It was certainly different but way too sweet for me. That evening we walked down the road to a street food market which was near. The smells and sights was amazing and I think this might have been the best night market we have been to on our travels. We grazed on satay stick, pork belly, squid, dim sum and ice cream marshmallows, until we were stuffed. Near the entrance to the market we spotted a tobacco shop and as I was running out of baccy and it wasn’t sold in the normal stores I went to have a look. It was just like being in an old fashioned pharmacy or sweetshop but instead of medicines and candy, the jars and bottles were filled with various shades of brown tobacco. I was slightly out of my depth but the guys working there were nice and showed me the ones that were most like what I was using, and you were welcome to try anything you wanted before you purchased. 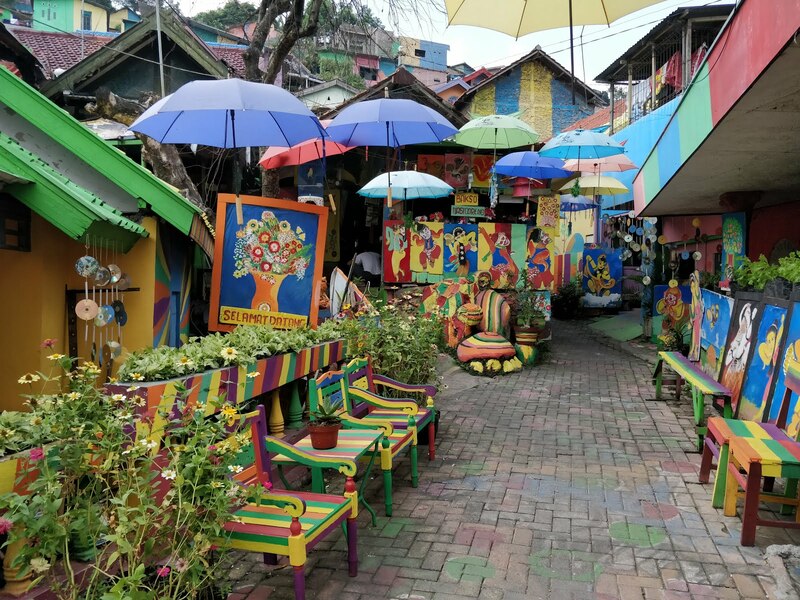 One of the main reasons we stopped in Semarang was because I’d read about the rainbow village they have here. It’s only a collection of houses on a hill that have all been painted in different colours but it looked very cool. The walk there was along a large waterway, which was used more as an open sewer, as we saw one local squat to demonstrate that morning, but everyone you pass smiles and shouts ‘Halo Mister’ so even amongst the dirt and the litter it was a nice walk. 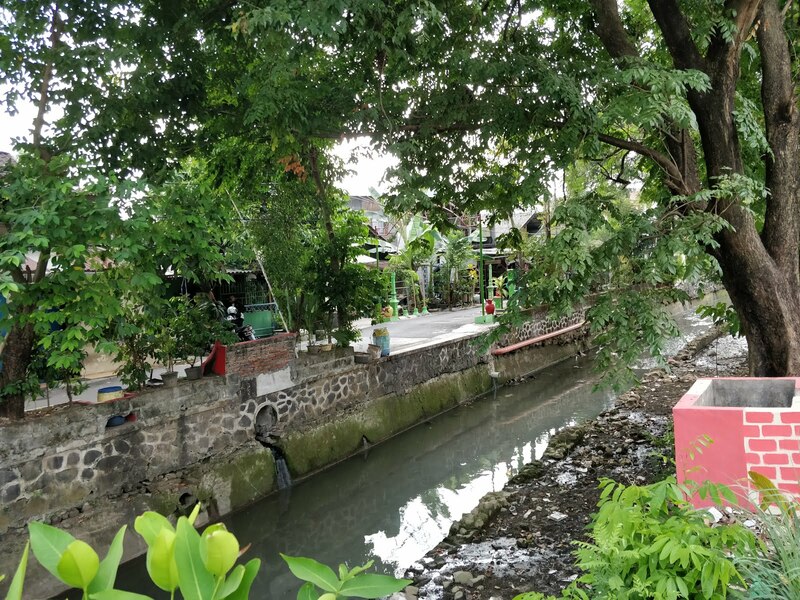 It was hot in Semarang, the buildings effectively stop any breeze and as the bricks and concrete heat up they blast warmth back out, by the time we’d walked the 30mins to the rainbow village we were in a muck sweat. The rainbow village colours although slightly faded are still beautiful as the residents have painted every brick wall, garden fence, door frame, window frame and even the paths a different colour, they have also hung bright flags and streamers out so the whole hill side looks like a festival. We walked up and down the little lanes taking some pictures, dodging chickens and cats and saying ‘Selemat Pagi’ to all the residents. 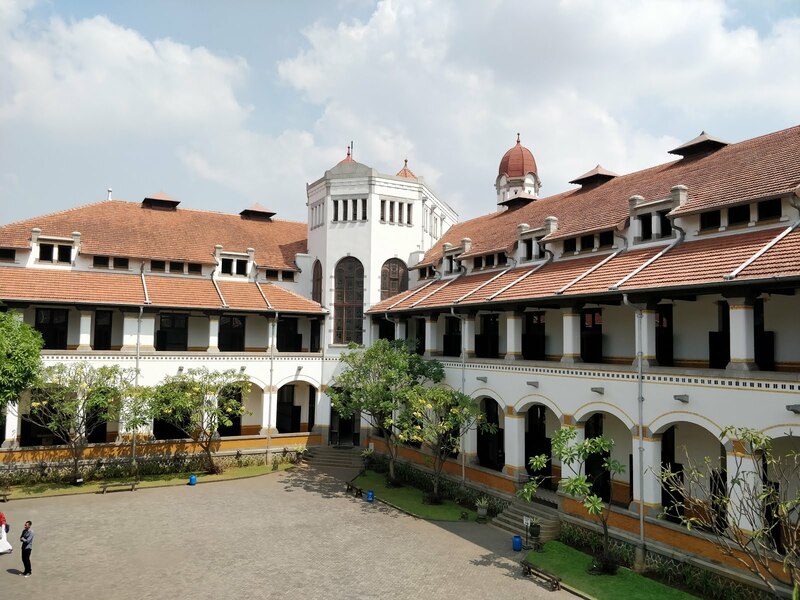 Nearby there was a huge colonial building which was the former headquarters of the Dutch East Indies Railway (Lawang Sewu). It has been extensively renovated and is now a local landmark with some historical exhibits inside, replica trains and large function halls that they rent out. 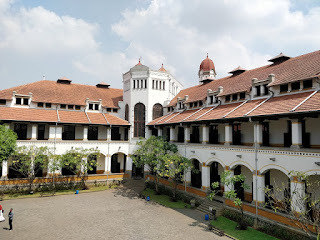 The architecture is stunning and although the exhibits were all in Indonesian we had great fun walking around the slightly spooky maze of empty rooms and doors leading off. We didn’t see any tour guides when we went, which was a shame as I hear this building has some rather gruesome stories associated with its past and is supposed to be haunted – something to do with the basement being used as a Japanese prison and executions taking place. We did go up into the roof to see the small group of bats that live there but weren’t brave enough to climb the rickety ladder up into the 2 bell type towers overlooking the grounds. We didn’t do much that evening except collect our beautifully laundered clothes and ate at the hotel. Early morning we squeezed in a buffet breakfast and then got a taxi to the train station. We had a two leg train journey to make today and the first was a 4hr trip to Surabaya, then a change of station and a second 2hr trip to Proboliggo. The east-west and north-south train tracks don’t meet up so you have to change stations in Surabaya, which just means a taxi through the busy streets but was easier said than done. Up until now we’d had no problems getting Grab taxis from trains and airports but this now changed as the local taxi companies have monopolised any pick ups near tourist spots, we didn’t realise this and it took quite a few cancelled Grabs and a walk away from the station before we could get a pickup. We had a few hours to kill before our train so went for some lunch at a nearby mall and then walked to the second station. As we were on this train for sunset we got given a free meal and drink to celebrate the breaking of the Ramadan fast. It was just Nasi Goreng (fried rice with egg) but was very tasty and it was nice not to have to sneak sips of drink for the last few mins of the journey. Arriving at Proboliggo we again were accosted by the taxi touts that wanted to charge us 60k rph to go a short distance to our homestay, on principle we said we’d walk although neither of us really fancied a 30min walk with backpacks on. We didn’t have to walk long down the road though as a 6 seater pulled over and said he’d take us for 30k, which was much more reasonable. Our chosen accommodation for here was Clover Homestay which had great reviews and offered info and tours to Mt Bromo. We had a ground floor aircon room with bathroom just across from the reception / seating area, which was already filling up with other travellers discussing tours for the following day. 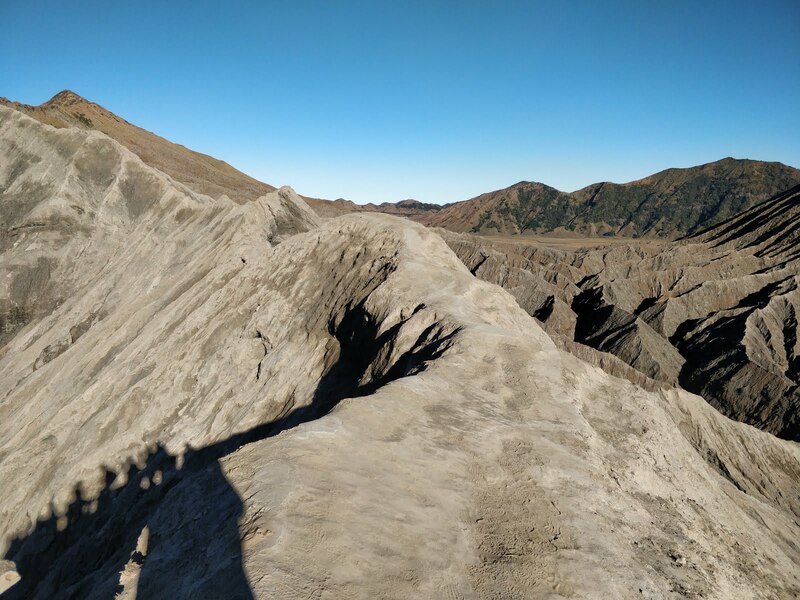 We had a chat with the owner and he told us all about Mt Bromo, what tours he could arrange, how to do it on public transport and even helped with train stations and routes for the next bit of our journey. 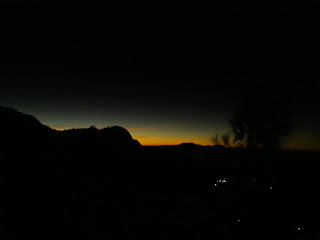 We ended up with a sunrise Bromo tour with 4 other guests (so it worked out very cheap), but it would leave at 2:30 so we’d need to be getting organised and in bed early. He even let us pay by card in advance, with 3% bank fee, as we didn’t have much cash. A quick trip to the supermarket for snacks and water then back for a delicious meal at the homestay, and they even had a cold beer on offer. 2am and the last thing I felt like doing was getting in a car with 4 strangers, driving an hour + and then climbing up a volcano… but that’s exactly what we did. We were sharing the car with a couple from Germany and an English couple, all of us were doing a similar route round Indonesian so the conversation flowed as we compared notes on different places. The sunrise stop is on King Kong hill, located on the old crater rim. You arrive with enough time to have a coffee at the car park then walk as slowly as you need up to the different view points, you can even get a pony to take you up but I wouldn’t have submitted any animal to carrying my weight up that steep concrete road. There are no signs to direct you up to the viewing platforms but we just kept climbing up as long as there was a clear path or steps (sometimes these steps were still under construction or a landslide had wiped them out) and soon we arrived at a large walled area that looked like that too was under construction. You could clamber a bit further but you would be clinging onto muddy slopes and tree roots so we all stayed put, plus although chilly it certainly was not cold and everyone was hot and sweaty by this time. I’ll admit that if I hadn’t seen the most amazing sunrise at Dieng Plateau a few days prior I’d have been disappointed with this one, as the actual horizon that the sun comes up over is obscured by the side of the hill you are standing on. 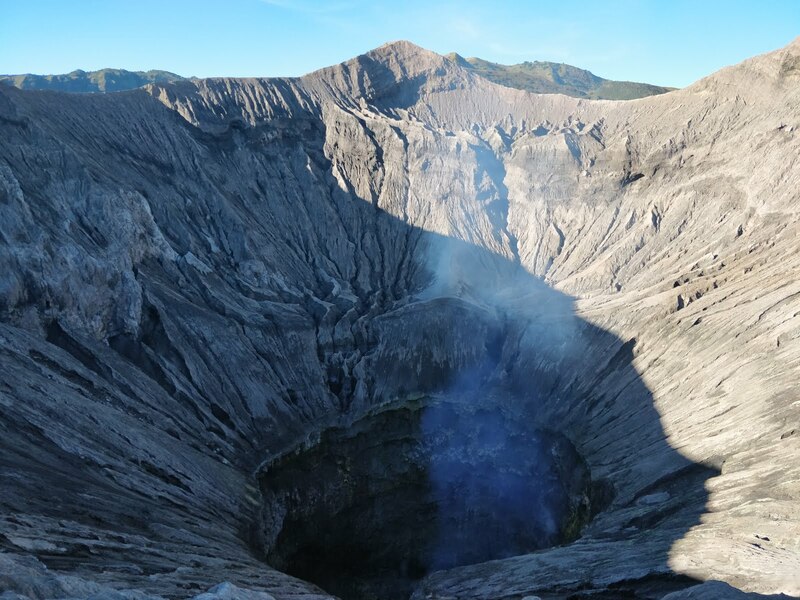 What was magical was the way the sun flooded through the valley and slowly lit up the crater below you, where you could see the smoking crater of Mt Bromo, the green slopes of Mount Batok with the large and looming Mount Semeru in the background. It was very beautiful and the only thing that would have made it perfect was to be able to see the sun breaking the horizon. We even saw Mount Semeru give off a puff of smoke but we couldn’t be sure if it wasn’t just a cloud lined up perfectly with the summit. Having taken 500+ photos each we walked back down to join the driver and went down the mountain a bit and onto the next bit of the tour. This involved a change of vehicle to a 4x4 and we were soon speeding across the sand to the foot of the active Mt Bromo. The cars drop you off about 800m from the base and you walk the final bit across the uneven terrain and then finally up 253 steps to the crater rim. Again you can get a surefooted pony to take you most of the way, and although these didn’t look like unhealthy or thin animals we declined their transport and I was very glad we were first onsite as didn’t want to think what state they’d have been in by mid-day. The sight that meets you at the top of the stairs is worth every step; steeply sloping sides lead your eye down to a steaming / smoking hole where you can just about see bubbling mud and yellow sulphur deposits. There is a concrete rail around the edge of the first bit you climb up to but a short walk left or right and this disappears and you can walk a bit further on the narrow rim edge with nothing to stop you toppling down into the volcano. Another 500 photos and we went back to our 4x4 for the journey back to the homestay for breakfast. As it was now about 9am the 4 others from the tour were literally grabbing their bags and shoveling down their food as the taxis arrived to take them to the station. We’d decided we were too old for that sort of rushing around, plus we had time on our side, so we’d booked an extra night at Clover. This meant after breakfast we had the luxury of going back to bed and catching up on sleep… which was bliss. After a few more hours kip, some photo sorting and book reading we went out to the common area to have a drink. The manager joined us and we had a really nice chat about local customs, different areas in Java, Muslim practises and his own travels around the world. Although the food had been great at the homestay we decided to venture out that night and having wandered around a bit we found a restaurant called D&C 19. It was very busy with locals here and the menu was all in Indonesian but we knew a few things to order by now so had Nasi Goreng, Beef Redang and Tempe. It was very nice and although they had warned me off a spicy version of the rice, it was actually the beef redang that knocked our socks off. The best bit was the final price as for everything including two iced milos only came to about £3.50. It looks like Mt Doom! Did you see Frodo and Gollum scuttling around the edge of the crater?